In other words, explosion of another pipeline in Mexico. Hidalgo's Security Minister announced the explosion of a secret outflow in a pipeline leading through the municipality of El Durazno in the municipality of Tlaxiaca . in the area conburbada with Pachuca . Dependent on the number of emergencies, a strong explosion was reported on Monday evening at 8:30 In one of the streets of this place near a hotel there was a strong fire from a secret power outlet. Elements of Pemex's army, civil defense, state police, and physical security went into the place To control the fire, and where a Redilla truck was also on fire, the vehicle allegedly carried Huachicoleros to fuel steal. TECUN UMAN, Guatemala (AP) — Central Americans traveling in a mass caravan broke through a Guatemalan border fence and streamed by the thousands toward Mexican territory Friday, defying Mexican authorities’ entreaties for an orderly migration and U.S. President Donald Trump’s threats of retaliation. Arriving on the Mexican side of a border bridge, they were met by a phalanx of police with riot shields. About 50 managed to push their way through before officers unleashed pepper spray and the rest retreated. Looks like Mexico might need help defending its sovereignty. Fully expect Trump, the dictator wannabe, to declare a national emergency in his speech tonight, or the day after, in order to resolve this political issue. I also expect it to be challenged in court. Ignoring the obvious issue of legal challenge to show that a national emergency actually exists..., his next course of action would most likely be to impact military readiness for his wasteful and pointless portion of a wall by taking funds from other military programs, or possibly lower quality of life for military families by taking from family housing. Trump will then have to work out how he can seize the private property of multiple non-federal land owners without congressional authorization, likely through the military, something with no precedent succeeding, but that has failed before in court. Mexican journalists are reporting American activists boycotting this whole situations. They are videos showing how activists encouraging migrants to stay and reject being taken the main shelter El Barretal where they have water,electricity,medical attention. Warehouse is a bomb! Good Lord. You haven't got a clue. Every republican I PERSONALLY know wants a WALL built. If all the Dems are as clueless as you are, no wonder they're losing. I'm talking about those in congress. A lot know it's really a pie in the sky project - expensive, unfeasible and really just Trump talking out of his arse. Congress holds the purse strings after all and frankly could have got it started by now if they wanted it that much. now without a majority they can at least honestly blame it on the Dems. It's obvious from their own inaction they never really cared. Vote 'em in, vote 'em out. More of a box they're all stuck in. The wall isn't much without security manning it from end to end. It's a shame Congress didn't pass this in 2007. The Secure America and Orderly Immigration Act (S. 1033), a bill proposed in May 2005 by Senators Ted Kennedy and John McCain, sometimes referred to as the "McCain–Kennedy or McKennedy Bill." The Comprehensive Enforcement and Immigration Reform Act of 2005 (S. 1438), a bill proposed in July 2005 by Senators John Cornyn and Jon Kyl, sometimes referred to as the "Cornyn–Kyl Bill." The Comprehensive Immigration Reform Act of 2006 (S. 2611), sponsored by Senator Arlen Specter, which was passed in the Senate in May 2006 but never passed in the House. The latest data show a staggering 23,121 parents and children traveling as families were caught jumping the border in October. That is nearly 40 percent higher than any other month on record, and it’s nearly 400 percent more than the number recorded in the same month a year ago. Wow that's an impressive jump in numbers! Media commentary on the migrant caravan, and President Donald Trump’s response to it, has frequently focused on the fact that it remains hundreds of miles from the U.S.-Mexico border. However, the caravan is just a small part of a bigger wave of ongoing illegal immigration from Central America that crashes against the southwest border every day. Every week, the number of people arrested crossing the southwest border illegally dwarfs the roughly 4,000 migrants traveling in the caravan.
. The massive procession of migrants winding through Mexico may be weeks away from the southwest border, but a “caravan”-sized number of people cross into the U.S. illegally every single day. Martha looks like any one of thousands of young California women, her life spreading out ahead of her, her dreams about to take off. Unlike most, however, the 20-year-old North Highlands resident is undocumented. And because of this, she and her family, most of whom do farmwork out in the fields surrounding town, have virtually no access to medical care. It's been this way since 2009, when Sacramento County nixed health care for its undocumented population to save just $2.8 million during an extreme budget crunch. This positioned Sacramento alongside many rural and conservative counties in California, rather than with other large metropolitan areas such as San Francisco and Los Angeles—most of which provide at least some health-care access to undocumented residents. Opponents of coverage in Sacramento argue that there’s nothing abnormal about the region’s situation. They say most counties in California don’t cover the people who are undocumented, and by law they don’t have to: Section 17000 of the Welfare and Institutions code, which deals with health care for the indigent, gives counties the option not to care for those in the country illegally . As a result, 49 of the state’s 58 counties don’t provide such coverage. Welcome to what US citizens also live with. No insurance and no money. To qualify for indigent care in a county you have to have less than $700. a month income, and the county can pick and choose who to see. What you get is doctors' visit at a doctors' clinic, e.r. , no medicine, and no specialists. no surgery. no tests, except perhaps what lab can be drawn in a clinic. My kids and I lived without insurance all of my working life, until they were grown and acquired their own insurance through employers or spouse's employer. My friend had no insurance and no money. it took me about 3 years to convince her to apply for SSI. They cut her off before her birthday to draw social security. She had had chemo and radiation for cancer one time. She died with cancer. Doctors were wanting to see her and to do tests, but between when SSI cut her off and her birthday, she had nothing. She asked them why they cut her off, and the lady said because they could. I know people today, who work, have no insurance, and who just don't go to the doctor for a lot of things. Yep. Sorry......... Citizens first. There is no way that taxpayer should be asked to cover illegals. Fr. Solalinde blames Without Borders NGO for migrant mess, "It was done to provoke Trump"
Solalinde accuses NGO of deceiving migrants; He says that he was deceived along with the Central American and Mexican migrants, the caravan brought polleros and armed persons to the city. Here the negative actor is the organization, Pueblo Sin Fronteras, says Fr. Solalinde. The priest and activist Alejandro Solalinde Guerra accused the civil organization Pueblo Sin Fronteras (Town Without Borders) for bringing the Central American migrant caravan to Tijuana to provoke the anti-immigrant policies of US President Donald Trump. "They ( Pueblo Sin Fronteras) are going to cause problems, as they are causing it internationally between the United States and Mexico, when in reality there was no need. The migrants from Central America celebrated their first week in Tijuana, have shown their desperation to meet the leaders who brought them to begin their process of humanitarian asylum in the United States. In this regard, José María García Lara, coordinator of the Migrant Alliance Tijuana, said he has also noticed the absence of Pueblo Sin Fronteras. "We already realized that this group is not taking charge. It is very unfortunate that they really do not take responsibility for something that is gradually become out of control," speaking about the demonstration that the migrants held in the Garita de El Chaparral. The simple fact they forced the borders of several countries, while refusing the asylum offers made by those countries, clearly show the intentions of this "migrants" caravan. A very hated and notorious person that smuggles Mexicans into the United States of America. Pollero literally means chicken herder for the way illegal immigrants, known as, " pollos ," walk behind them through the harsh border region like a big bag of chicken feed. The ministry and his way of the cross for the migrants have made him the person with the most prestige and moral authority within the Catholic Church and in Mexico, to the point that he has been considered as a candidate of the Nobel Peace Prize. In some ways, his fight for migrants in Mexico and the world is a kind of protection of his own ministry and life. Among the Central American migrants the idea has even grown that Father Solalinde is the Monseñor Romero of Mexico to the migrants. As Congress plans to push through a stop-gap bill to keep the government open for two weeks, Democrats are standing firm against the $5 billion President Trump wants for a border wall. President Trump said Tuesday that he’d use the military to build the border wall to circumvent Democratic opposition. In the early morning tweetstorm, Mr. Trump stressed that sections of the wall have been renovated or newly constructed, but Democrats are still withholding the funding to continue building along the border. I suppose it would be easier to blow out a canyon and then build a bridge over it. Buh the econony... So its all cool and dandy when hr lies. Overall, some type of barrier runs along about 685 miles of the 1,954-mile border. But 654 miles came before Trump took office, constructed under the Secure Fence Act during the Bush administration. More than 31 of 40 miles have been constructed, and nine remaining miles are scheduled to be completed by 2019. Construction began on 4 miles in El Paso and New Mexico, and 14 miles of replacement in San Diego should be done by May 2019. What would $5 billion be used for? SAN FRANCISCO — The Trump administration provided adequate justification for its decision to end a program that reunited hundreds of immigrants from Central America with family members in the U.S., a federal judge ruled Monday. The judge, however, found the administration had sufficient policy and legal arguments for its decision to end the Central American Minors program. The Obama administration granted refugee or parole status to 99 percent of the people it interviewed for the program, giving them a greenlight to come to the U.S., according to State Department figures in Beeler’s decision. All the links to that article links me back to the original article. So rather than comment on the original article I've no choice but to comment on their links, linking them back to the original article. That's not how links are supposed to work. Strange, when I click on the link, it just links me to the article. The original article. Don't you see Cowboy's Daughter? They've trapped us in a Labyrinth. Motherfuckers! Well, now we know where the thousands missing from Benito Juarez went to! Kevin K. McAleenan, commissioner of U.S. Customs and Border Protection, said more than 1,100 of those caught either jumping the border or trying to come through a border crossing without permission were children, either traveling alone or with parents, and forced on the treacherous journey. He said the 3,029 people caught on Dec. 3 was the highest total in years, and said at the rate illegal immigration across the border is running right now, the numbers of families and children could be double the record rate recorded last year. CAMPO, Calif. — U.S. Border Patrol agents working near the U.S./Mexico International Border recently found a two-year-old child traveling without her parents. On Nov. 27, at approximately 6 p.m., Border Patrol agents apprehended six undocumented foreign nationals two miles north of the border near Campo. Traveling within the group was a two-year-old child, who was strapped to the chest of a 17-year-old male. According to the young male, the child had been with her mother the night before on Nov. 26, but she became tired and asked if one of the group members could carry her daughter. The 17-year-old youth, traveling alone, offered to carry the child while the mother rested. The young man also related that at the U.S./Mexico International border, he still had the child in his possession. His group separated before crossing into the United States and the boy could not locate the girl’s mother. His group subsequently was apprehended two miles north of the border near Campo. United States Border Patrol: What is a Hero? 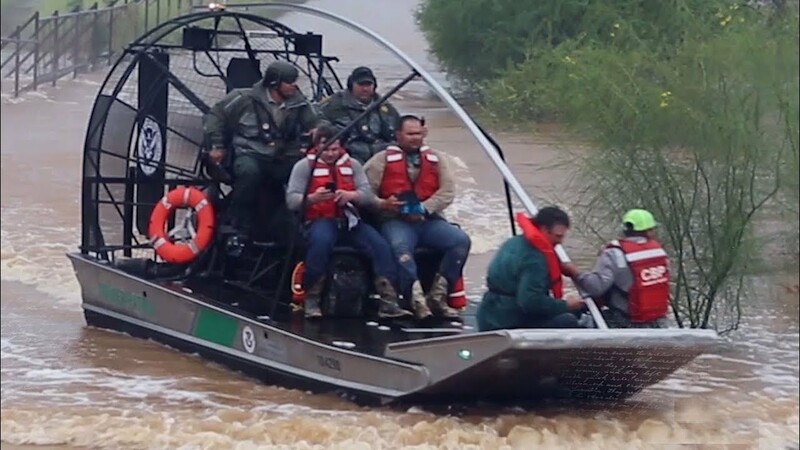 This video highlights the humanitarian efforts conducted everyday by the men and women of the United States Border Patrol, our heroes, who go above and beyond the call of duty and always place service before self. The Democratic Party is definitely not looking out for the best interests of our Country! Congress needs to close loopholds that are being exploited or be voted out! WASHINGTON—A caravan’s worth of illegal immigrants cross the border every day—as has been the case for years. But the numbers are currently on a sharp upward trend. The recent caravan of around 8,000 migrants mostly from Honduras—an anomaly because of its size and propensity for violence—created a media frenzy for a couple of weeks, but while the coverage has waned, the illegal border crossings haven’t. In the past two months alone, more than 100,000 people have been apprehended for illegally crossing into the United States. That’s the highest number for October and November in four of the past five years (the end of 2016 spiked before President Donald Trump took office). During fiscal 2017, almost 400,000 people were apprehended along the southwest border after crossing illegally—averaging out to almost 1,100 per day. A further 124,500 turned up at ports of entry without documentation. Driving the increase are family units from Central America. Immigrants from Mexico seeking asylum in the United States will no longer “be released” into the US following an historic announcement from United States Secretary of Homeland Security, Kirstjen Nielsen, Thursday morning. Effective immediately, “individuals arriving in or entering the United States from Mexico — illegally or without proper documentation — may be returned to Mexico for the duration of their immigration proceedings,” Nielsen wrote in a statement. You can read the full statement from Secretary Nielsen HERE . As they should and most nations would do!